The NJCBM possesses the latest technology Quartz Crystal Microbalance with Dissipation (QCM-D) equipment that can perform in situ and real-time measurements of mass and structural changes during the formation of molecular layers with ng/cm2 sensitivity. The simultaneous measurement of both mass and structural properties give a thorough understanding of molecular adsorption and interaction under a variety of experimental conditions. NJCBM is the Q-Sense North American Center of Excellence and through this collaboration QCM-D training courses are held quarterly in our laboratories. Measurements are currently carried out using the Q-Sense E4 instrument. 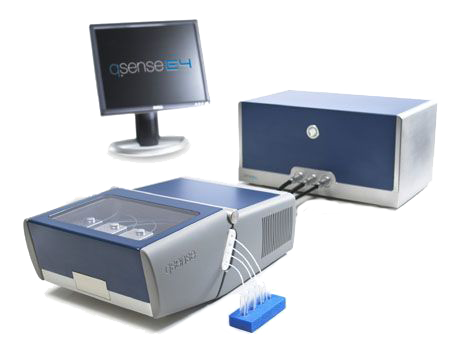 This is the newest generation of systems and allows for the rapid characterization of bio-interfaces through the simultaneous measurement of four sensor chambers. The E4 also has an optional electrochemistry cell. MTS Sintech 5/d mechanical tester and Bose Electroforce 3200 are available for various types of mechanicanal tests including tensile,compression, bending and cyclincal loaind. Both machines allow measurements to be made udner physiological condition while the sample is immersed in a saline bath at 37 °C. on the QCM-D technique, Q-Sense training courses can be obtained at www.q-sense.com or by contacting Dr. Sanjeeva Murthy.